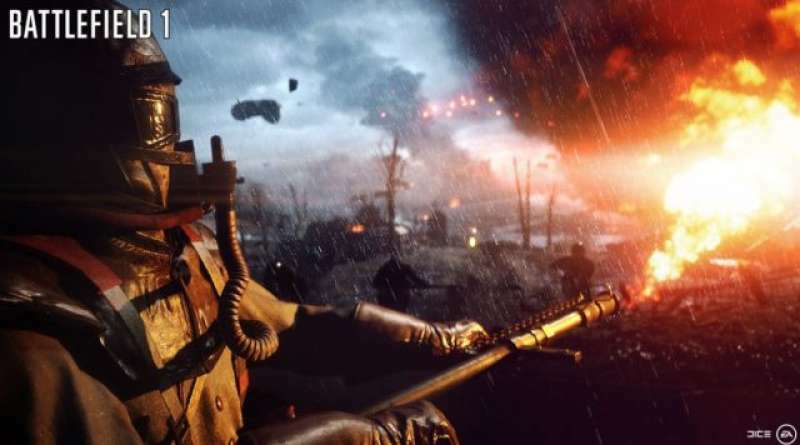 The Battlefield series has always been one of the quintessential PC titles since the original Battlefield 1942 way back in 2002 and its developer DICE has been known for going the extra mile for PC gamers, with fantastic hardware optimization and being at the forefront of AMD’s mantle back in Battlefield 4, though Battlefield games have always been plagued with glitches and bugs at launch the worst of which was Battlefield 4 and while having great gameplay was practically unplayable for most people until several months later. And that’s where we come in. Today we will be bringing you the first part in a multiple article series on Battlefield 1 and its performance, though we only have some limited testing now due to the fact that Origin limits 5 hardware swaps per 24 hour period including IP changes… That aside we plan on running the gauntlet with our current GPU and CPU setups, but for today we have my primary test bench which is an Intel i7 5820K at a modest OC of 4.2GHz and dual R9 290s with that said and done lets jump in! 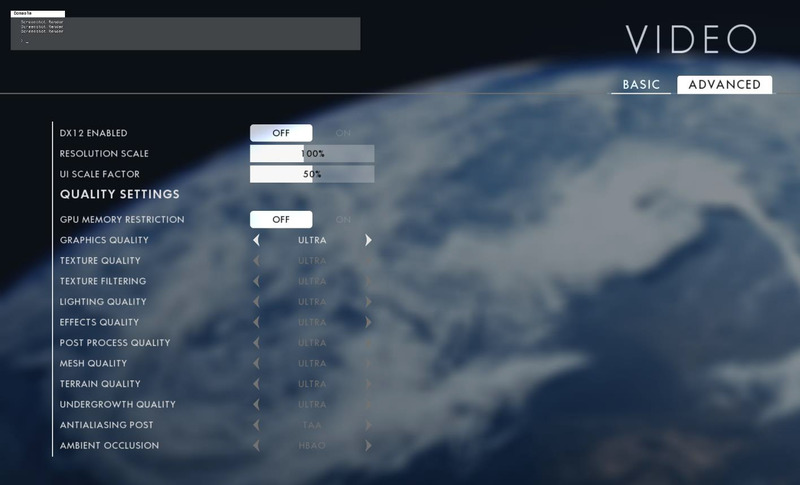 For our settings we used the Ultra Preset with a 90 Horizontal FOV and changed resolution or DX12 as needed. Game performance is measured in both average FPS, as well as Frame Time, both of which are logged using Presentmon and analyized in Excel Each game is tested a minimum of 3 times with the average of those results being displayed in our scores. We’ll test the game at both 1080p, and 1440p using our AMD R9 290 in both single, and CrossFireX configurations at The ultra preset. We’ll then do further testing at 4.2GHz and 3.4GHz in order to test any variation. We benchmark the game using the “Over the Top” mission in the “Through Mud and Blood” War story in single player, which can be immediately accessed after completing the tutorial mission. We start our runs just after the game loads into the level with the game initially controlling the tank allowing a very consistent starting point we then move along the forward path until the run is over at 90 seconds, this is a good indicator of performance in single player while being incredibly consistent. We have yet to figure out a way to benchmark multiplayer, but will be working on it in the coming weeks. 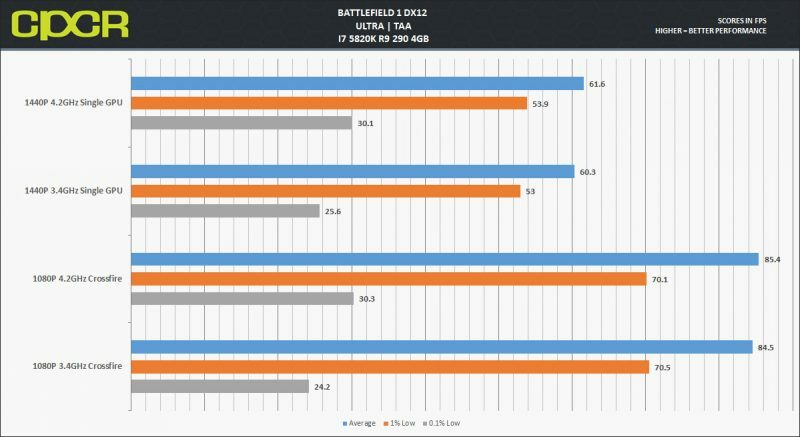 As we see from the graph above with a single R9 290 we are able to hit a solid 60 FPS at 1440P although the minimums stay around or slightly below 30, I will say it isn’t as noticeable as it may seem from the numbers and the spike happens during several explosions on screen at once most of the time the game sits in the 1% range. 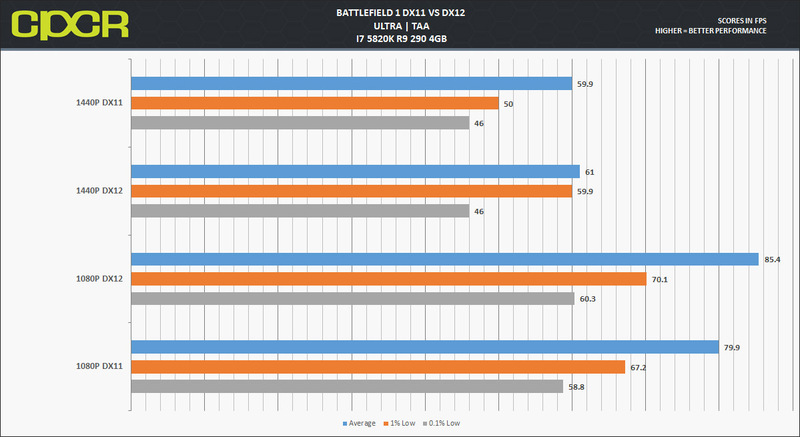 Overclocking certainly helps the minimums but outside of that, the performance is rather stable even at 800MHz lower. 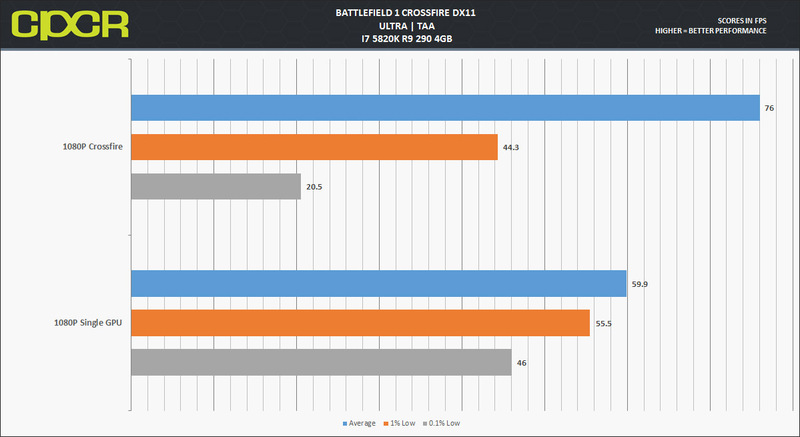 Here we see that the crossfire configuration is performing much worse in the minimums than the single GPU counterpart, even though it readily beats it in the averages…Unfortunately Crossfire support leaves much to be desired at this present time, we will be doing follow up tests with game patches and driver updates in the future. And finally you see rather consistent performance between DX12 and DX11, with DX12 seeming to be just a slight bit better. Since we don’t have any stable benchmarks for the multiplayer, there is no data we can give at this present time however I will mention that there is no significant gamebreaking bugs, server or client side crashes in about 4 hours of playing. Unfortunately Crossfire still needs some work and is reminiscent of Star Wars Battlefront, hopefully AMD and DICE can work on this in future game updates and drivers, as well as enabling MultiGPU support in DX12. We did see that DX12 isn’t quite as game changing as we would have hoped, with only marginally better performance compared to DX11 this was a bit of a disappointment. CPU clock speed seemed to barely make a difference, though we will see if that remains true with our AMD FX and APUs in the coming weeks. Again this is just a taste of what we will be putting out for this game so be sure to check back with us in the future!